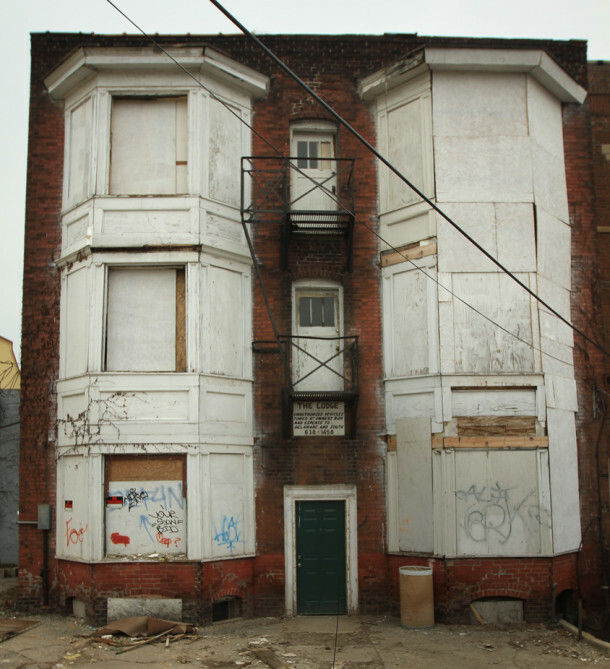 How do historic properties, listed on multiple National Registers, become abandoned neighborhood eyesores? Lawsuits were filed against the owners of two such buildings, the Chadwick and the Lodge apartments two years ago. While National Register placement does not provide any additional legal protection, building codes and ordinances can be utilized to help protect such properties. One must question how did these properties get into such a degraded state before any such legal action was taken. On April 11, 2011, the property owners of both buildings were handed lawsuits by city prosecutors for “allowing their historically designated properties to become public eyesores or community dangers.” (“Legally Preserving History,” Michael W. Hoskins, TheIndianaLawyer.com, 4/27/2011) How do such historically and architecturally significant buildings get to this point of abandonment, legal wars, and urban decay? Both buildings had a bright future. 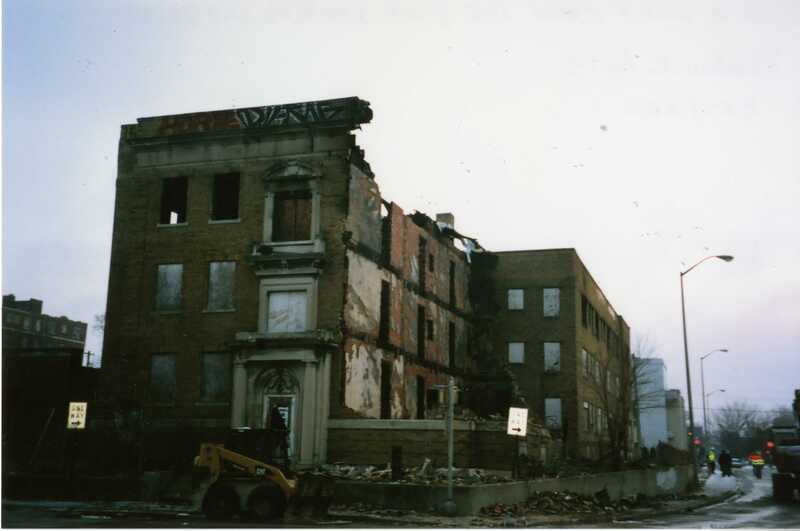 They were listed in the National Register of Historic Places for Apartments & Flats in 1983 – this was the largest historic district for apartment houses in the country at the time (“Historic Listing Paves Way for Renovation,” Douglass Davidoff, IndyStar, 11/1/1983”). Their futures were even more promising, with 25% tax credits available for restoring the historic properties. In fact, 17 of the 37 apartment buildings listed in the NRHP are in the St. Joseph neighborhood, where these two structures lie (“St. Joseph Area Called Historic,” Karen Presley, Indianapolis News, 11/28/1983). The St. Joseph neighborhood was then nominated as a historic district by the NRHP in the next decade. So how could these buildings fall through the cracks? 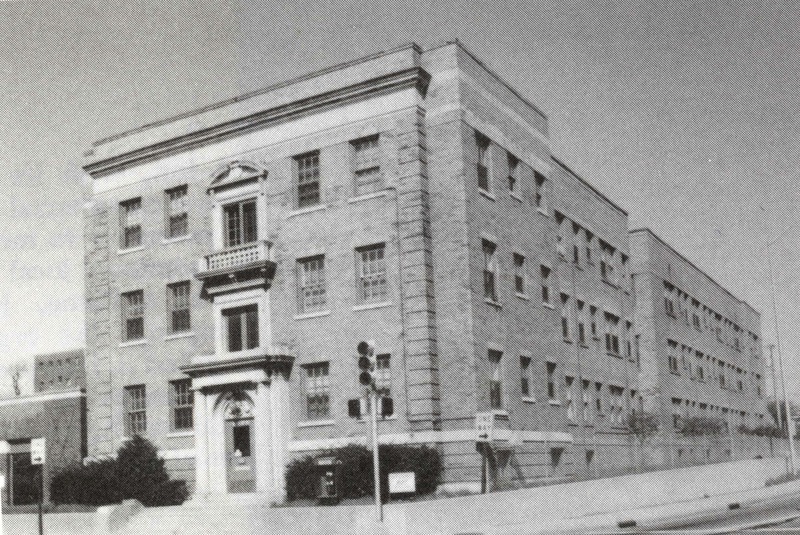 Built in 1923, the Chadwick at 1005 North Pennsylvania Street was most likely named after Charles D. Chadwick. Blinded as a teenager by an accident, Chadwick was a local developer who also had his own loan company and possibly had his hand in many other real estate ventures (St. Joseph Historic Area Plan, IHPC, 1991). Chadwick founded and built the Indiana Board of Industrial Aid for the Blind and was also a passionate advocate in the state for legislation assisting the handicapped (NRHP Apartments & Flats, 1983). Developments on the structure were initiated in late 1922, when Meyer-Kiser bank sold $120,000 in preferred stock for the future 48-unit building (Ad, IndyStar, 12/30/1922). An advertisement from the Indianapolis Star in 1923 says that the apartments were completed August 1st, 1923, and that “there are just a few more apartments available. Each apartment consists of a large living room, kitchenette, dining room with walnut gate-leg table; large bed closet, with Murphy in-a-door bed; numerous drawers, hooks, clothes rods and walnut dressing table. We furnish heat, light, gas, and water. $52.50 to $58.50.” (IndyStar, 8/20/1923) The building was also the home of local astronomer, John Candee Dean, who was interviewed many times for the Star in regards to celestial news (“Brook’s Comet Seen by Local Star Gazers,” IndyStar, 9/18/1911). There has been no mention of the structure in the city directory since 1978. The Chadwick’s Georgian Revival style was very sophisticated for its time, with high quality materials and construction. Georgian Revival Style, also related to Colonial Revival Style, is characterized by a mixture of Colonial styles and contemporary elements, some of which are exaggerated or disproportionate to other elements of the structure (Identifying American Architecture: A Pictorial Guide to Styles and Terms 1600-1945, John J.G. Blumenson, 1977). 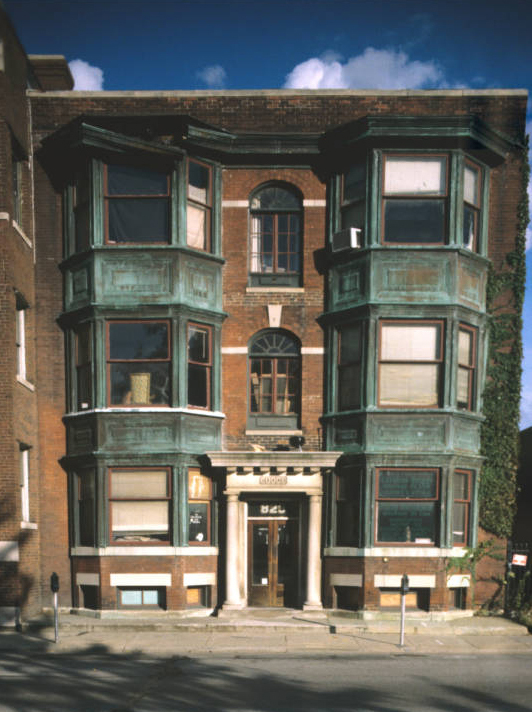 The Eastern-style flat was five bays wide and three stories high, made of buff colored brick with limestone details. The entry was flanked by columns that held up an entablature; a balconet above on the third floor completed the entire middle bay of interesting limestone detailing. Like other apartments of the time, the edges of the façade had faux quoins made of brick. There were many other Georgian motifs at one time (NRHP Apartments & Flats, 1983). Between the raised basement and first floor was a limestone string-course; the Pennsylvania Street façade also had a very large and smooth limestone frieze. The Chadwick was demolished after a fire in January of 2011. Sadly, this was at least the third fire in the building since 2001. Seventy firefighters responded but to no avail; the $750,000 damage estimate was a total loss and the structure was deemed so structurally compromised it had to be demolished quickly (“Building Fire Closes Downtown Streets,” WTHR.com, 1/24/2011). A lawsuit against James E. Chalfant and Chadwick Partners, Inc., was filed by the city to recoup the money spent on the demolition of what was left of the structure (“Legally Preserving History,” Michael W. Hoskins, TheIndianaLawyer.com, 4/27/2011). The Lodge, located at 829 North Pennsylvania Street, was built in 1905. Caleb Newell Lodge was a trendsetter in downtown apartments – at this time, north of Walnut Street was all single family homes until Lodge decided to demolish the family home after the death of his father, James Lodge, with the intent to construct an apartment building. Soon after, other landowners in this desirable area just north of commercial downtown followed suit, including the Sylvania and six others. Caleb Newell Lodge was a DePauw law graduate, treasurer of the John S. Spann Company (real estate firm), and member of the University, Columbia and Marion Clubs (St. Joseph Historic Area Plan, IHPC, 1991/ NRHP Apartments & Flats, 1983). 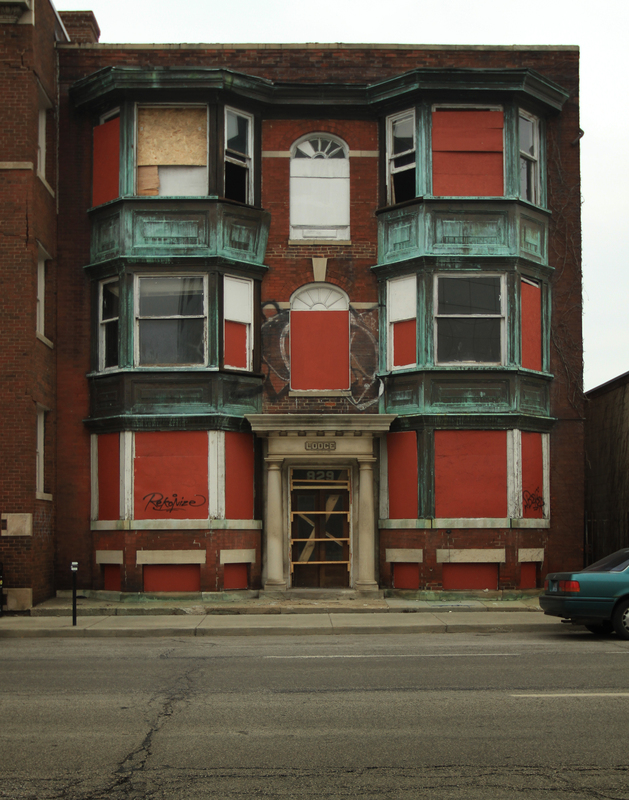 The bachelor lived his entire adult life in apartments and flats, including the Chalfant and the Columba Club (NRHP Apartments & Flats, 1983). Lodge hired Edgar G. Spink for the task of demolishing the family home and constructing the flats for $11,000 (St. Joseph Historic Area Plan, IHPC, 1991). 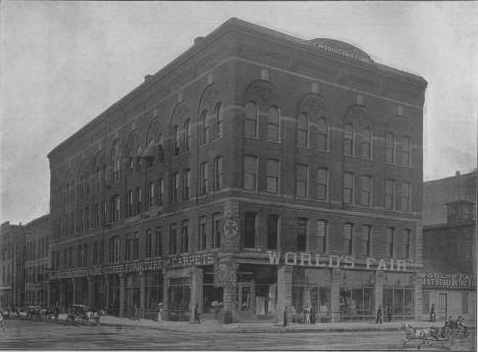 This was Spink’s first project in Indianapolis – the E.G. 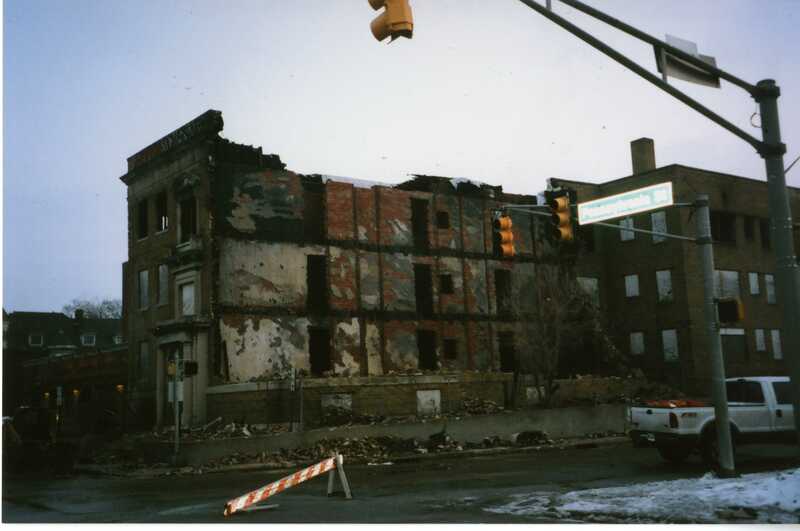 Spink company quickly became incredibly successful with constructing and managing around sixty apartment buildings in the city (St. Joseph Historic Area Plan, IHPC, 1991). Spink came to the city on behest of his sister in 1904 to supervise the erection of Dr. Fletcher’s sanitorium, Neuronhurst (NRHP Apartments & Flats, 1983). Spink’s connection to the Lodge greatly increases the historic value of the property, because Spink’s ability to “strengthen the popularity of the apartment in the city, especially responding to the needs of single women, older couples, and the newly married by providing comfortable, attractive residencies at affordable rates” made him a key player in residential architecture downtown (NRHP for St. Joseph Neighborhood, 1988). Lodge moved to Los Angeles, California, in 1925, where he died 15 years later (NRHP Apartments & Flats, 1983). A small version of the Eastern flat style, the Lodge is one of the most celebrated examples of Georgian Revival Style in the NRHP nomination form. Georgian Revival Style, or Colonial Revival style, was one of the foremost styles in the U.S. during the first half of the 20th century (A Field Guide to American Houses, Virginia and Lee McAlester, 1984). The three-story red brick building is three bays wide on Pennsylvania Street. There were twelve units total, four on each floor. The entrance is framed by a Doric order portico and on either side are full polygonal bays with unique copper inserts. The name, “The Lodge,” is carved on the frieze. The entire north side abuts the Cathcart Apartments next door. 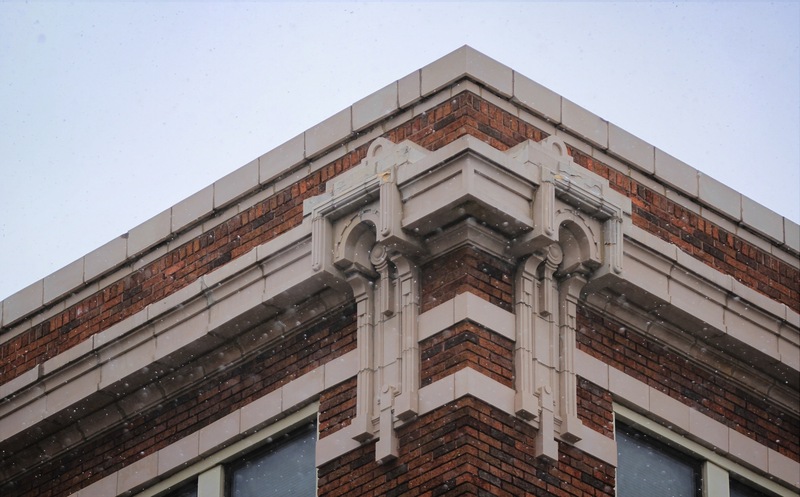 The cornice goes along the entire façade above the windows of the third story. According to a previous tenant who lived in an apartment on the second floor east half (back half) of the building, the north and south walls were brick. When one walked into the apartment there was an archway into the kitchen and steps down from the kitchen went into a bedroom that felt more like a grand hallway. The bathroom, which featured a clawfoot tub, was connected to the bedroom. The living room was at the end and featured the bay windows. There was also a small porch connected to the back entrance that was no bigger than room for a grill. 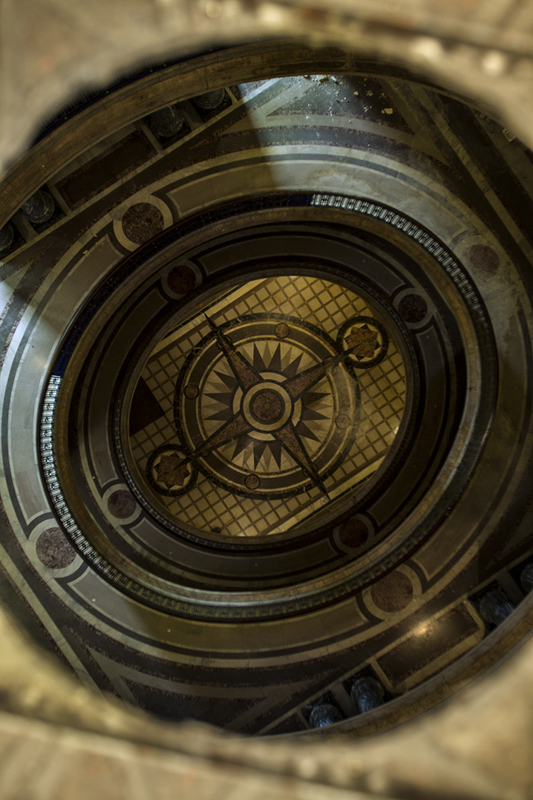 The entry area had an ornate staircase. There were stained wood baseboards and molding, old doors, and hardwood floors throughout the building. 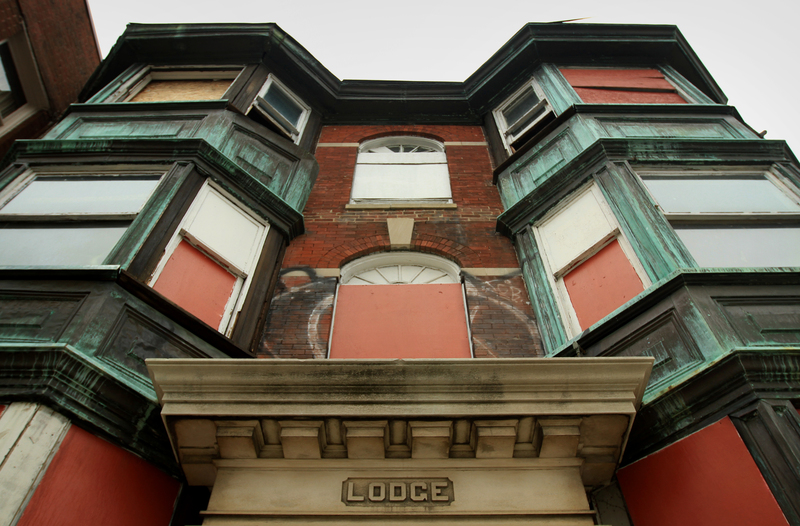 The Lodge’s future has been all but determined. An article from 2007 described a redevelopment proposal in the area during the Central Library’s huge expansion. Real estate developer, Buckingham Properties, supposedly invested millions of dollars in multiple properties in the area – the Lodge is mentioned specifically in the article (“Storybook ending? Next Chapter in Central Library Saga Could Yield a Commercial Boom for Surrounding Area,” Jeff Swiatek, IndyStar, 12/22/2007). I lived across the street at the Plaza Apartments from 2007-2008 – during this time, and I never saw any improvements at the Lodge. Perhaps Buckingham had a management contract with the owner of the building, and then decided to abandon the property after discovering how much renovation work it required. Multiple calls to Buckingham have not been returned, and those I was able to reach would not or could not provide any information regarding the property or the redevelopment proposal. The building was listed on the MLS in 2010. 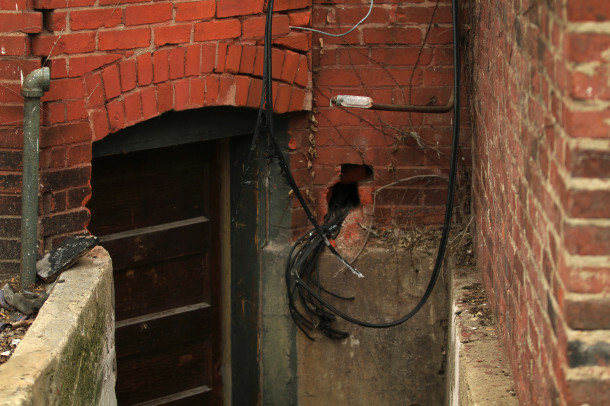 In 2011, a lawsuit was filed against Caroline Briggs, stating that she “unreasonably caused community damage by allowing that building to become dilapidated, harbor vermin, serve as a temporary residence for vagrants, and contribute to blight.” (“Legally Preserving History,” Michael W. Hoskins, TheIndianaLawyer.com, 4/27/2011) By 2012, Michael Wyatt of Century 21 was listed as the owner on the state property tax database. The MLS currently lists David Wyatt as the owner. 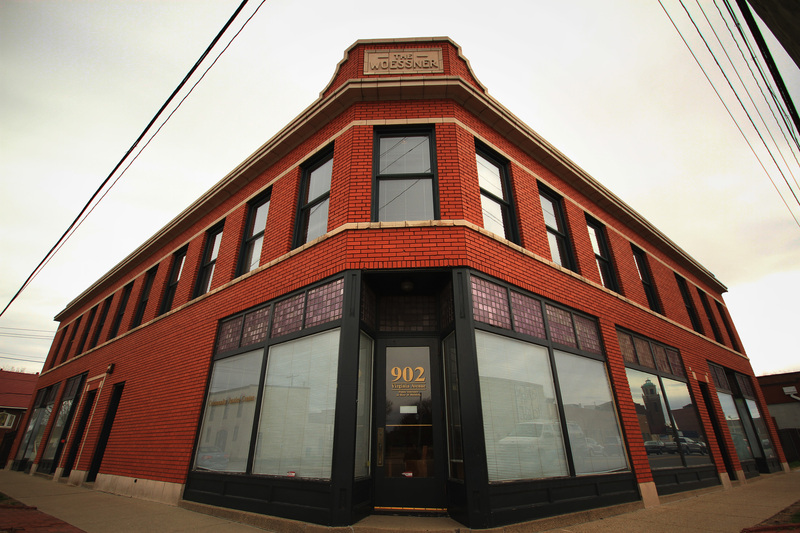 Supposedly the building was sold a month ago for $229,000, but the MLS information was not updated. The former resident lived there for about a year and half, in 2002-2003. He said the building had so much potential (and never had running water), but was the “most dysfunctional building I’ve ever lived in.” Uncomfortable about his mother leaving the apartment and having to step over homeless people and drug users in the hallways, he moved out. The takeaway from this resident is that everything was so old and charming, but nothing ever worked. Two years later the Lodge was condemned. 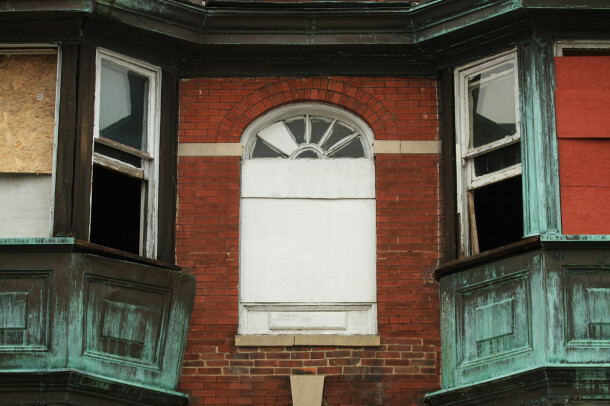 How does such a significant building get to this point of dilapidation? Preservation enthusiasts must be the catalyst to prevent more historically and architecturally important buildings from reaching this danger point. We can only hope that the Lodge’s recent buyer holds the same sentiment as us. PreviousFamily Tree: Get It Published! 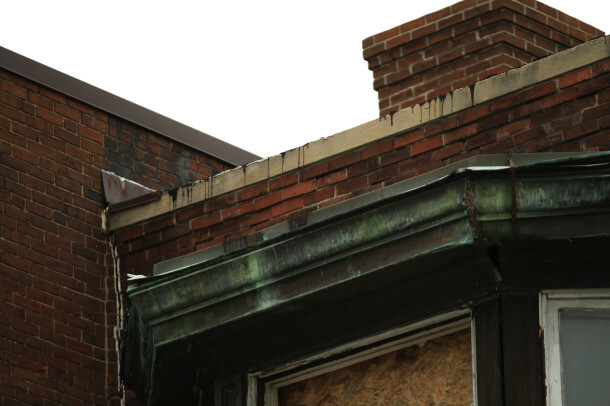 Although these are “sad” stories, they must be told so we can be more proactive in the future to “step in” and move on historic preservation when needed. A good friend used to live in the Chadwick, and remembered the owner apparently purposely letting it go…he thinks the owner(s) purposely set the fire to burn it down, several times, but couldn’t prove it, of course. Very good–and sad–article Jordan. I looked at moving into the Lodge around 1989 and remember the exposed brick walls. Eventually moved into the Spink at 234 East Ninth a few years later. I first read about this neighborhood in Charlotte Cathcart’s book Indianapolis From Our Old Corner. Their family home was on the site of the present Cathcart apartments. The book has a picture of it–a little hard to see for the trees–but a simple three-story frame house. Her father was a Civil War veteran and was partners in a downtown bookstore in the late 19th Century. They were next door neighbors with the Lodges and the book has quite a few interesting little stories about them and the neighborhood. They were also friends of the Fishback family. Back in the early seventies I remember some interesting old houses in that neighborhood including one a few doors north on Pennsylvania Street. It had been incorporated into apartments and was called the Timber Lodge. Came down to the library one Saturday during the winter and saw that it had burned. From the neighborhood’s (St Joseph) point of view, it wasn’t for a lack of trying. For years, we went to practically every Health & Hospital hearing, Environmental Court hearing and lobbied the City and IHPC, regarding both of these properties. It is a sad, sad case of some property owners knowingly cheat the system, doing just enough to stay ahead of compliance and out of the line of fire. It is maddening, and it takes a huge will of perseverance and patience on the neighborhood’s part. Historic district protections not withstanding, the City seems challenged in enforcing current maintenance standards, either through code compliance or ordinances. Frustratingly, after a damaging fire, the Dept of Code Enforcement has no problem in executing a demolition within two hours time. At that point, a protected historic district has run out of options. The Chadwick—that was certainly a LOSS. Chalfant and his partners got their way, but to my knowledge, they never did buy another property in any of our other downtown historic districts. The Lodge—a WIN. Caroline Briggs, the owner is out, and City legal attorneys and Judge Certo helped parlay the Lodge’s fate into the hands of a contractor (Michael Wyatt) who has stabilized and cleared the building. Incidentally, Briggs had initially brought Wyatt into the project, hoping he would be able to help her retain ownership. So, as of February 2013, Wyatt has continued to work on the interior, with the intent of the new buyer finishing the redevelopment. We look forward to the Lodge being SAVED and welcoming back its’ charming character to that corner of the neighborhood, directly across the street from Central Library! Yah! That is encouraging news, Garry! I had suggested Jordan get ahold of Leah, as I know she knows the whole saga and might have some photos at Riley, but thank YOU for this update! I spoke with Leah last week. I’ll be updating this story this week, and hopefully we’ll be able to document all of the positive changes coming to the Lodge soon! Jordan, have you been by The Lodge recently? I have and something is going on with it. Looks like prep work. Lets hope its for the better and not demo prep. We are the Owners of the Lodge, bought it in 2013. Should be complete by Christmas (been a long project). Come take a look.